Two years after the Womxn’s March on Seattle shouted to the world, "This is not normal," we’ve learned some lessons — the biggest of which is that for many communities, this is normal. On Jan. 3, we witnessed the swearing-in of the most diverse freshman class of U.S. congressional representatives and senators in our country’s history. Pundits framed the moment as historic and celebrated its many firsts: The first openly bisexual woman, the first Somali-American and hijabi-wearing Muslim woman, the youngest woman, the first Native American women. In total, 42 women joined Congress that day, bringing the total to 126 out of 535, or 24 percent. To call this fact “history-making” is to acknowledge that until now and by design, our nation’s story had been imagined, told and implemented overwhelmingly by white men. Our story, until now, has been their story. But that story is too narrow to convey our diverse and talented communities, nationally and here in Seattle. That story can’t properly depict our challenges — from climate change to racial injustice to the struggle for sovereignty over our own bodies. This moment isn’t just historic in its diversity. It’s historic because this is the moment we begin to write the new story, helmed by new storytellers. Together with all its “firsts,” this moment brings a much deeper pool of ideas, experiences and talents to draw upon for the answers to those complex challenges. Make no mistake, this moment will be framed as a threat to the status quo and those accustomed to writing the story. But we know it is real hope. As organizers of the inaugural Womxn’s March on Seattle in 2017, we stepped into a moment of outrage and disbelief. We see more clearly now, however, how that moment was not an anomaly, but rather the predictable outcome of systems that have long excluded and oppressed people. 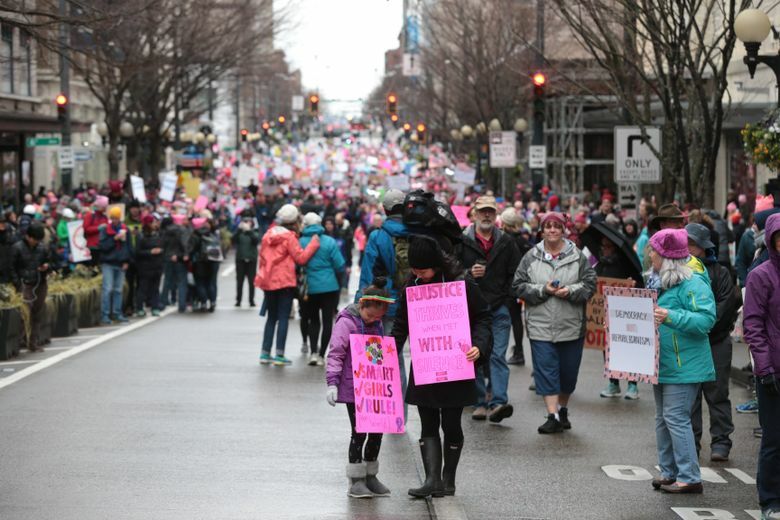 Two years after the Womxn’s March on Seattle shouted to the world, “This is not normal,” we’ve learned some lessons — the biggest of which is that for many communities, this is normal. We applied this lesson to this year’s events first by recognizing that the anniversary of the Womxn’s March falls on MLK Day weekend. Humbled by the long legacy of the Martin Luther King Day Organizing Coalition, we reached out to them early in the organizing process. The collaborative result is a three-day weekend of complementary action and activism. All programming this year emerged from partnerships with communities who are the most impacted by systemic injustice. With a program team of more than 20 diverse womxn, we chose our theme, “Building Power,” to represent this historic moment. It is only by working together, and recognizing that our strength and our liberation are interwoven, that we will reach justice and equity for all. The scheduled events this weekend were organized to honor the new story being written in America. Liz Hunter-Keller is a communications professional and a member of the Womxn’s March On Seattle team since it started organizing in 2016. Pam Emerson is a landscape architect with the city of Seattle on water pollution prevention. She is the outreach co-chair for Womxn Act on Seattle.